Rumors have been floating through the Internet’s tubes about a Vanquish Volante since mid-July. 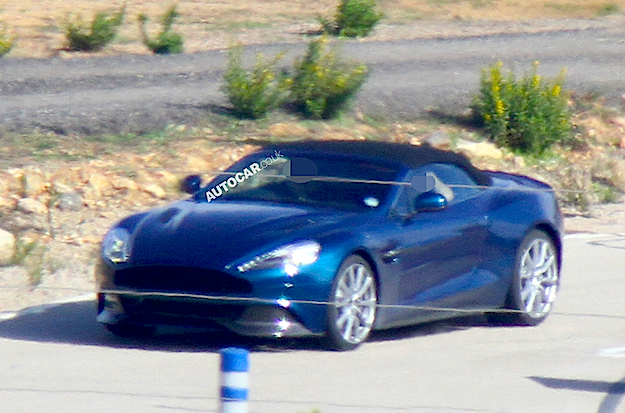 Now, however, Autocar has spied a real-life Vanquish Volante in person and snapped some pictures. Industry analysts are predicting the convertible version of the Vanquish will go on sale worldwide in mid-2013. Until its official release, we can only predict the Vanquish Volante’s exact stats. It appears that Aston Martin has retained many of the subtle, yet gorgeous, lines of the Vanquish Coupe. All too often drop-head variants sully the carefully crafted lines of a vehicle — not to mention the handling characteristics — for an open-air effect. Excitingly, the rear spoiler has been elongated, which adds a nice visual distinction over the standard Coupe and negates the need for a rear spoiler and improves high-speed stability. It appears Aston has opted for a soft-top versus a folding metal roof, no doubt to save weight. While we can’t see under the hood, undoubtedly Aston has carried over the six-liter V12 from the Vanquish Coupe that produces 565 horsepower and 457 pound-feet of torque. Autocar is reporting an estimated 0-62 MPH time of around 4.5 seconds and a top speed of 180 MPH based upon assumed weight increases. If you’re in the market for a European flagship sports car drop-top, you’ll be looking a price tag around the $318,000 mark. For more exclusive spy photos, check out the Autocar article.